For this review we try one of our favorite cigars for the first time — obviously! Punch and Draw give full review to a premium stick, the Dunhill Signed Range Selecction Suprema, from General Cigar for its October 2015 release. Punch and Draw go on an unexpected winter trip with their first impression review of the TL Johnson Legend Reserve 63 maduro toro. This week the Nubbit brothers learn that Old School is more that just readin’ writin’ and ‘rithmetic. Today Punch and Draw pharm-out at Big Sticks Fine Cigars in Mesa, Arizona and “medicate their minds” with a PSyKo SEVEN toro from Ventura Cigars. The Nubbit Brothers light up a very limited, new, cigar and pretty much stay on topic. This week Punch and Draw weigh in on the Don Pepin Garcia cigar rated 96 by Cigar Aficionado Magazine, which also ranked it number-one in their top 25 of 2012. 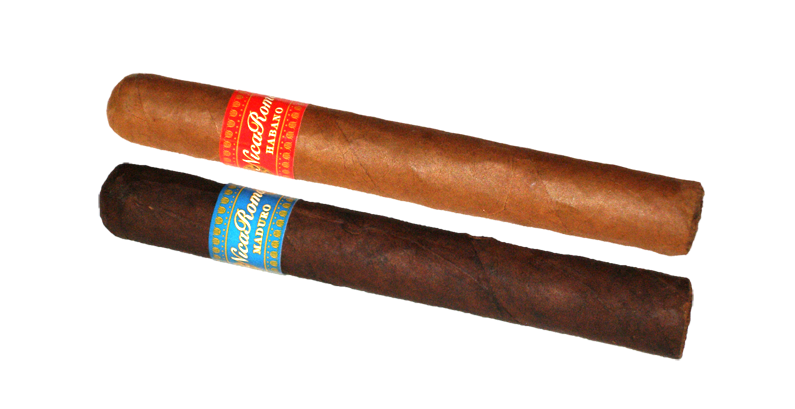 Previously Punch and Draw weighed in in two of the three variations of Villiger’s fledgling NicaRoma line. Today they chatter about the third one – the Connecticut. 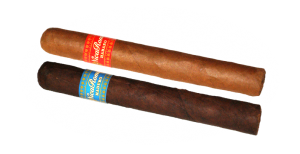 Today Punch and Draw sample two varieties of one of Villiger’s latest offerings – the NicaRoma.